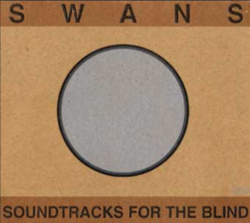 Swans Soundtracks for the Blind, their last studio album released in 1996 prior to their 2010 reformation, will be released for the first time on vinyl by Young God Records on July 20th 2018. Much requested by Swans fans, the vinyl package will consist of four LPs in jackets enclosed in a box with a poster, insert and download card. The box set will be a limited edition of 4,000 copies worldwide and once sold out will be followed later in 2018 by a gatefold LP version. The album will also be reissued on CD featuring a repackage of the original digipak for the 1996 Atavistic release plus a bonus disc of the contemporaneous Die Tür Ist Zu EP (a German language version of some of the material from Soundtracks that also includes unique material) recently released for the first time on vinyl in the USA for Record Store Day 2018. Outside of the USA Die Tür Ist Zu EP will be released as a limited edition companion piece double vinyl set.